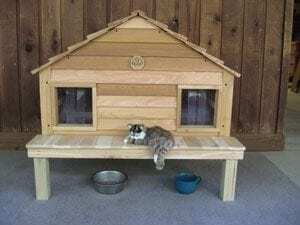 The platform is a perfect accessory for the cat houses. It raises the house 12 inches off the ground to provide an extra area (10 sq. feet) underneath the house that is shaded and out of the weather for food and water storage or just a cool place to lay around. The platform has two upper decks. The front deck is 7.5″ x 44″ and the rear deck is 5.5″ x 44″. So no matter what time of the day it is, there will be shade on one deck or the other! The legs are heavy pressure treated 3×3’s that will be more stable in high winds and have less tendency to warp and twist. The platform comes assembled. Simply insert the legs in each corner, install the screws in the pre-drilled holes and set the cat house in the Platform pocket … Done! Please note: The optional platform will not work with the optional Porch and Deck system.